Raise your hand if you’ve ever felt overwhelmed or intimidated by setting a holiday table. If you’re raising your hand, know that I’ve been right there with you. I can remember a time when it felt like a really hard task… but honestly, setting the table for a holiday really doesn’t need to be all that stressful or hard… promise. All that matters at the end of the day, is that you’re gathering together with family and friends to celebrate. And if we’re really being honest, the only necessities are the plates and silverware… okay, and maybe a glass! But we also like things to be pretty too, right? I honestly have so much fun switching up the dining room. The dark moody shelves are such a fabulous backdrop to anything I choose to place on the shelves! And this year, they got a pretty big makeover in the accessories I’m displaying (more on that tomorrow though!). I’m honestly looking forward to sharing more of the dining room (and those shelves) with you tomorrow, but in the mean time, here’s a little sneak peek! Fabric for Table Runner- This is similar. 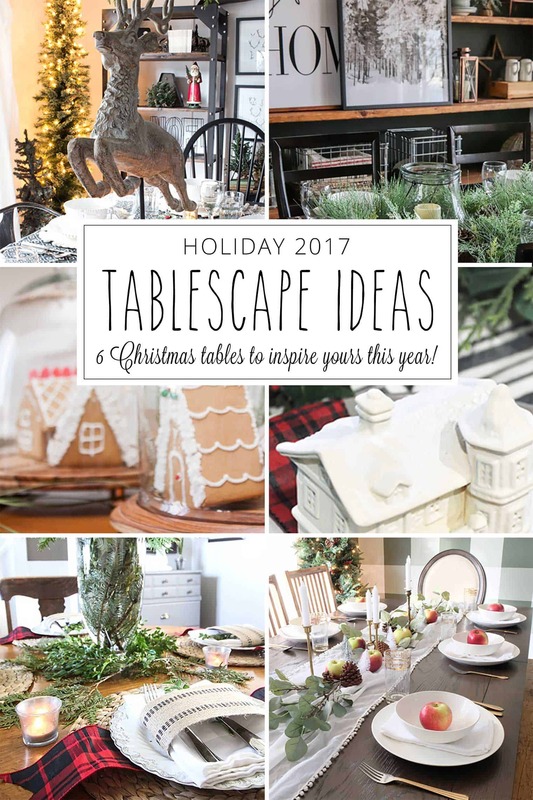 Be sure to visit these other talented ladies for even more table setting inspiration! They always blow me away with their talent! Oh my goodness! I love your giant wall of shelving! That’s such a brilliant solution! And your super simple but super effective tablescape was pretty great too! Thanks so much for inspiration! Gorgeous. I love that wall of shelves and the way you always arrange things on it. Adding the artwork is genius. Your table looks great! I was wondering, how do you print the snowy landscape print? Do you just take it to Staples or a store like that? Thanks! Shayna, the table and dining room look gorgeous! This is beautiful! I was wondering what size is the winter trees print you made and how to do it. You said you’d give details soon, right? Love that and your other print too. Your shelves are great. Is that a flat paint or eggshell you used on the wall? Thank you! Yes, I’ll be sharing all the details and the tutorial on how to do the tree print Monday! I did use flat wall paint on the dark wall, specifically because I didn’t want any light bouncing off and creating glare. Love those shelves! And that tree print is soooo lovely. I love the green runner. I too have done the same thing with some of mine, just fold the fabric to fit your needs. Love this table setup. The whole space is beautiful! Have a wonderful holiday season!